Every photographer, beginner or professional, knows that photography is an expensive profession. Buying a DSLR camera will cost you around $500, and additional equipment can go from 10 bucks to a couple of thousands. Many will tell you that you don’t need all the fancy equipment to be a great photographer, and to some extent that statement is true, but the additional equipment and accessories will, for sure, make your job easier, and your photos look effortless. Because of that, it’s always smart to invest in equipment, so I’ve picked 13 must-have accessories for you. The walk-around lens is something you should always keep on your camera because you never know when will a possibility for a perfect shot occur. These are small and lightweight lenses with a large focal length, that can satisfy your every need. The walk-around lens can cover anything from wide-angle to telephoto, so with just one lens, you can shoot landscape, portraits, architecture and various events. With it on your camera, you’re ready for anything that comes your way. Released in 2014, this extremely versatile lens, with a 16.7x zoom, can cover virtually every possible shooting situation. It’s great for capturing beautiful landscape images, portraits, group shots, birds in flight and every single thing you come across. And your handheld shot images stay sharp and blur-free due to Vibration Reduction image stabilization technology. Check the Nikon 18-300mm Lens Price on Amazon. Read more about budget telephoto lenses for Nikon. This compact, lightweight lens is amazing for travel and everyday purpose. Image Stabilizer (IS) system allows you to shoot handheld and still end up with crisp, sharp and high-quality images. It does have some distortion at the ends, but other than that, this is a great choice for anyone who wants to cover a large focal length with just one lens. Check the Canon 18-200mm Lens Price on Amazon. UV filters, also known as Haze filters, are low-cost basic filters. They are clear filters, with a coating on the glass that blocks the ultraviolet light waves in order to reduce haziness. But, their main use is protecting the front element of your lens from damage, dirt, dust, and splashes of water. When buying a UV filter, be sure to get the best quality you can afford, with a special multi-resistant coating (MCR). Trust me, it’s much easier to change the broken filter than it is to change or fix the lens. Polarizing filters are best known for increasing contrast between clouds and the skies. Polarizers come in a secondary rotating mount, which you manually use to change the effect. They darken overly light skies and increase the color saturation, and when they are used on water surfaces, they eliminate glare and reflections. Polarizing filters are extremely useful for landscape photographers, but be careful when you’re using a polarizing filter on a wide-angle lens, especially if you’re shooting blue skies because polarizer can unevenly darken some parts. ND filters are gray-toned filters that reduce the amount of light entering a lens, and by doing so, shutter speed is decreased and exposure is increased. This is particularly useful when you shoot in bright light conditions. ND filters are perfect for getting that smooth, silky streaming waterfall or showing a movement on a busy street. This type of filter is not meant to stay on camera all the time, so use it only when necessary. Before buying a lens filter, be sure to check the diameter of your lens, you don’t want to buy the wrong size. Here’s a great resource for filter sizes for popular camera lenses. Rocket Air Blaster is a powerful, and useful tool made out of a durable silicone rubber. This gentle tool safely blows clean air to remove dust and other debris without leaving smudges on lenses. Check the Rocket Air Blaster Price on Amazon. This double-ended cleaner, on one end, has a brush for wiping the dust off, and on the other end, a carbon-filled felt tip for absorbing oil and other particles. Felt tip is recharged with carbon every time you cap the pen, however, once the felt on the tip is worn, it can leave smudges if you use too much pressure. Check the LensPen Price on Amazon. Individually wrapped, pre-moistened wipes are a safe and effective way to clean your lens, without leaving scratches or marks on it. Zeiss wipes gently remove all bacteria, fingerprints, and dust, and these wipes don’t contain artificial fragrances. A pack of 200 disposable wipes is just pennies per wipe. Check the Zeiss Lens Cleaning Wipes Price on Amazon. It’s all about the lighting! Making your own lighting ambient opens up creative paths you didn’t know existed. Those who are interested in studio work know how important the right lighting is. However, choosing the right lighting is a hard task for every photographer, novice or a professional. I’ve picked the best flashes for Nikon and Canon users, as well as the top seller on Amazon. The Nikon SB-700 Speedlight is a bit pricey flash, aimed at professionals who know a little more about flash photography. It’s a versatile Speedlight that gives you perfect balance of exposure and performance. SB-700 features i-TTL (Intelligent Through-The-Lens) flash control that delivers accurate exposures. Nikon SB-700 is compatible with most of the Nikon DSLR’s. As Nikon’s flash above, the Speedlite 430EX is aimed at those who know what they’re doing with flash photography, however, beginners will easily learn how to use it too. It’s a premium priced product but, it’s the best of the best, and it is worth the money. 430EX is a zoom flash that covers a range of 24-105mm. 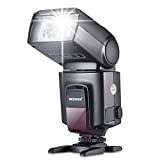 Neewer TT560 is a budget flash, and it is compatible with a variety of cameras with single-contact Hot-Shoe. This is a pretty basic flash with limited features, but for a novice in photography, this is a great choice. This is a versatile tool for flashes, for photographers who want to get more out of a flash. MagBeam incorporates Fresnel lenses to give you up to 2 to 3 stops of useable light. This tool is compact, durable and easy to set up and use. Magmasks are included in MagBeam kit, with them you can play with different patterns and creatively control the light. MagBeam is a perfect solution for portrait, wedding and especially wildlife photographers. Check the MagBeam Kit Price on Amazon. Learn more about how to use the MagBeam. If you don’t want to use a flash, and you strive for a more natural lighting, reflectors are the best solution. Reflectors, like the name says, reflect the light on the places in shadow. Just adjust the angle of the reflector to shine a light on the shadowy place or subject, and you’re ready to shoot some amazing photos. They are easy to use, cheaper than flashes, and the images look more natural because you’re using reflections of a natural light. Best on the market is the Westcott 301 Photo Basics 40-inch 5-in-1 Reflector . With this option, you get five different colors to play with: white, silver, black, gold and translucent. Camera straps are very useful to have. They provide a safe and comfortable way to carry your camera, without the need to haul your whole camera bag. The amazing thing about camera straps is, there are millions to choose from, and they are usually cheap so you can buy a bunch of them to complement your look. Of course, there are some that are quite expensive, like the ones for the professional photographers who want more than just a fashion statement. My pick for the best functional camera strap is the Black Rapid Sport RRS-1BB Shoulder Sling Strap. This is a perfect choice for those photographers who need a padded strap that is comfortable to wear for extended periods of time, because they are carrying a heavy camera, waiting for a quick, perfect shot. If you’re not a fan of camera straps, and you don’t like when your camera is dangling around your neck, Capture Clip Pro is the thing you want. Made out of aluminum, this durable construction is strong enough to carry your full-frame camera with lens attached to it. Capture Pro can be attached everywhere, whether that was your belt, backpack or a bag, and it will securely hold your camera whatever you do. It also serves as a tripod head. The Capture Clip Pro is a great solution for those who want their camera ready for a shot at all times, but they also want the security that camera strap cannot provide. Check the Capture Clip Pro Price on Amazon. It doesn’t matter whether you’re a photographer or just a regular person, tangled cables are everyone’s nightmare. For a photographer, it is extremely important to figure out cable management. Maybe someday, we can all be as meticulous in managing cables and gear as Casey Neistat. But, I suppose that that comes with years of experience. Until that day our perfect option, for starters, might be Skooba Cable Stable DLX . With Skooba, you can store all your cables, batteries and other little things that might get lost in a big camera bag. Check Skooba Cable Stable DLX Price on Amazon. If you want a super sharp photo you are going to need a tripod. However, a small act of pressing the shutter release can ruin an image, so a cable release like the JJC Mechanical Release Shutter Cable is a must-have. A Cable release prevents any vibrations that can result in a blurry image. Wi-Fi shutter release is also a great option, but unfortunately, not every camera has an integrated Wi-Fi. Tripods are basic tools with one main objective – to stabilize your camera. Photographers who are interested in architecture, landscape, portrait, macro and long-exposure photography, know that a tripod is a must-have. Some may say that tripods aren’t necessary, but at some moment you will find yourself trying to mount a camera on a makeshift tripod, using everything that is within your reach. Think ahead, and find a tripod that is best suited for your needs. There are extensive variations of tripods, and depending on your needs, you will have to take into consideration height, weight, and load capacity of the desired tripod. Check Vanguard Alta Pro Price on Amazon. UltraPod II is a perfect travel tripod, with a maximum load capacity of 2.7 kg. This versatile tripod features D-ring Velcro cinch strap, which can be secured around chairs, bikes or tree branches. Because of its tiny size and the ball and socket mount that is adjustable to any angle, UltraPod II is perfect for macro photography. So, if you’re looking for a small and sturdy tripod that works great and is super affordable, Pedco UltraPod II is the best choice you can make. Looking for more tripod options? Check out our guide to the Best Budget Travel Tripods. A camera bag is extremely important, it protects your expensive gear, provides a safe and easy way to transport your equipment and sometimes lets you make a fashion statement. There are many different bag styles for photographers, and you can pick the one that is best suited for you. Before buying a camera bag, you have to figure out how much equipment you’re going to carry, how much protection you need and how often do you travel. Because of the extensive options, we cannot find the perfect bag that will be best suited for everyone, so I’ve picked top rated and my personal favorites. This is a bag that adapts to your needs, due to origami-inspired FlexFold dividers that let you change the layout of the bag. It comes in two sizes, the bigger model can carry full-frame DSLR, three lenses, a 15-inch laptop and other accessories. There is also a built-in tripod carry feature that works for almost every tripod. Peak Design Everyday Messenger is available in two stylish colors, charcoal, and heritage tan. This backpack is not as pretty as Everyday Messenger, but it’s big enough to carry two smaller DSLR bodies (or one full-frame body), 3-4 lenses and various accessories. The AmazonBasics has adjustable cells, so you can fit your equipment however you wish. Even fully loaded with your gear, AmazonBasics is very comfortable to wear. Every photographer knows that post-processing is extremely important, and the best way to do it is with Lightroom or Photoshop. With these programs, you can completely alter the image you took, or change it to look exactly like your eyes saw it. Everyone who is interested in shooting Raw images knows that Lightroom and Photoshop are essential. Get for yourself these programs, watch some Youtube tutorials and play around. You will not regret it. Check out Adobe Creative Cloud on Amazon. All the accessories on this list will surely help you better your photography skills. However, before going on the spending frenzy, try yourself with just a camera and a kit lens. Go slow, find your strengths and weaknesses, and work on them. Test the water, there is no need to jump headfirst into accessories. As your basic knowledge grows so will your gear. With that said, I hope we’ve helped. Shop smart!